GEELONG is set to have three Irishmen on its list next year, with Stefan Okunbor to join Zach Tuohy and Mark O'Connor at the Cattery. The final details are still being finalised, but the 20-year-old is likely to accept a two-year rookie contract with Chris Scott's side. There will be an influx of Irish talent in the AFL in 2019, with James Madden (Brisbane) and Mark Keane and Anton Tohill (Collingwood) already signed and Jordan Morrissey linked to Essendon. As if Meghan Markle, Her Royal Highness the Duchess of Sussex, hadn't already won over crowds across Australia on her Royal Tour to the country, her prowess with an Australian Rules football has won her a new legion of fans. Travelling to Melbourne today, Prince Harry and the Duchess of Sussex attended a function at Government House. Whilst there, the Duchess was given the opportunity to show her style with the oval ball. Without any time to rehearse, Meghan Markle showed a great ability to handpass. Pictures from The Australian newspaper show a solid command of technique. Not only has she impressed those in attendance, but Australian Football followers across the world have embraced the Duchess. Being an American and marrying into the British royal family, the Duchess of Sussex might yet be a wonderful, if unsuspecting, ambassador for the game. After an exciting day out in Cork, Ireland, the Euro Cup is done and dusted with the Denmark Vikings once again taking out the Men’s Division whilst the Irish Banshees won the women’s title. Both teams have now claimed their third titles with Denmark winning their first title since their back-to back tournaments in 2014/5. The Irish Banshees also won the women’s title in 2016 in Lisbon, Portugal and in London in 2014. The Denmark Vikings won their way through the round matches and finals to meet the Irish Warriors in the final. They defeated last year’s winners, the England Dragonslayers, in the semi-final before defeating the Warriors by 14 points in the final. The Irish Banshees and England Vixens had little trouble advancing to the women’s final with big semi-final wins, but the Banshees were far too good for 2017 winners, the England Vixens, taking the final by a commanding 25 points. Only 4 days remain before 350 players from 15 nations descend on Cork, Ireland, and the first ball is bounced at one of the world’s premier international football spectacles, with AFL Europe’s Euro Cup 2018 earmarked to be the best in the events eleven-year history. The city on the southwest coast of Ireland will play host to 64 matches on the day at the Cork Institute of Technology sports facilities, as Europe’s premier national teams face off in the nine-a-side format chasing the title of champions of Europe. That crown currently belongs to England in both men’s and women’s divisions after their Dragonslayers (men’s team) & Vixens (women’s team) both took the spoils in Bordeaux at the 2017 edition of the tournament. Lions from across Europe descended on Denmark last weekend with the second instalment of the Lions Cup. The tournament was created and commenced in Lyon, France, in 2017, with the tournament decided by for and against results. The North London Lions were deemed inaugural winners. Last weekend it was the Odense Lions from Denmark taking the title. The tournament saw the host team, Odense Lions, the North London Lions and the ALFA Lions from France competing in a three-way round-robin. Odense won both of its matches on the day to take the cup ahead of the North London Lions in second place and the ALFA Lions third. Fresh from a highly competitive AFLG season, the vast progression of the game in Germany will be on show in Cork this October as the German Eagles women make their maiden voyage to a Euro Cup competition, heading to Ireland alongside their 2017 bronze-medal winning male counterparts. Leading the side as the inaugural female skipper, Ioanna Kopasaki, who says that the lack of experience is going to be no barrier to her side’s performance, and if anything, can allow the Eagles to be at their best without any burden of expectations. Last Saturday, Austria came alive to the sounds of footy with the 2018 Austrian Challenge at Rugby Donau Park in Vienna. 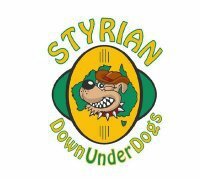 The Vienna Galahs hosted the Styrian DownUnderdogs. The following report from Austria, provided by the DownUnderdogs, looks at the game. Last Saturday saw the first game between two clubs from Austria since 2013. The Vienna Galahs, a phoenix club from the old Vienna Kangaroos, invited the Dogs from Graz to fight for the 2018 Austrian Challenge trophy. On a early sunny afternoon, the two teams had a warm-up session together and kicked off almost on time. After an absence from the Euro Cup for a couple of years by the Valkyries and Vikings, both teams are mounting a two pronged assault upon Cork. Maybe even hoping to instill a little "dread" into the Irish and other cup contestants as in history as did those dragon headed ships when they appeared on the horizon. The women’s side will once again be led by Odense Lionesses veteran and superstar Maria Falkesgaard. The Russian domestic season has been completed with the two St. Petersburg teams – the Cats and Tigers – doing battle to decide the 2018 title. The following media release from the St. Petersburg Cats details the event. On a cloudy September 23nd, St. Petersburg footy fans gathered onto SKA stadium to see the Grand Final of St. Petersburg 2018 Cup. There were two opponents – the St. Petersburg Cats and Northern Tigers – and both had won 2 games during 2018 season, so a deciding battle had to be played. During the first quarter, Cats started only with 8 players on the pitch due to the late arrival one of their teammates. However, even with this handicap, the Tigers were struggling to stop their opponent’s offense, resulting in a 21-point lead to the Cats’ by the first break. After that, the white-and-blue team continued to develop their advantage, scoring one goal after another. Tigers tried to make their comeback in the last quarter, but it was too late for them. The final score was 91 to 32, with St. Petersburg Cats being declared the champions of 2018 Saint Petersburg Cup. Ryan Davidson from the www.afl.com.au website has reported on the eye-catching performances of a couple of potential Irish recruits after they impressed at last week’s NAB AFL Draft Combine. Held at Marvel Stadium in Melbourne (formerly Etihad Stadium), the Irish lads held their own and more up against the best of the prospective AFL draft prospects for 2018. IRISH prospects Anton Tohill and Mark Keane believe they've shown enough to deserve a spot on an AFL list, and several clubs are interested in signing the promising duo. 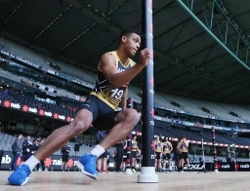 After impressing at the Dublin Combine last December and at the AFL Academy's camp in Florida in January, the youngsters earned an invitation to this week's NAB AFL Draft Combine, and they didn't disappoint.